Dave: What kind of guitar is that you're playing in the strum pattern video? Lyle: You can use an acoustic or electric guitar for the rhythm riffs with this jam. Lyle: Since the chords in the jam are dominant chords, not minor, then the Major pentatonic scale in A would be a great choice of scale to use when improvising. Lyle: Learn this scale and try playing it against the jam track, you'll hear how nice it sounds with the jam. Lyle: When playing the blues in any key, major, dominant, or minor, the minor pentatonic scale almost always works good when improvising. Lyle: In this solo example I use the A major pentatonic for everything but the "4" chord, D. The 4 chord is a great place to switch to the minor pentatonic when you are using the major pent. Why? - Examine the A and A7 chord, it has a C# which is a major third, found in the major pentatonic scale as well. 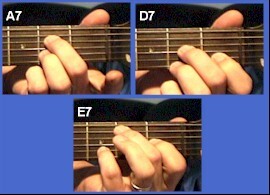 When you go to the "4" chord like a D7, the C# turns into a C natural, (the b7 in the D7 chord). The C natural is in the A minor pentatonic. A subtle, yet big difference when looking to be a little extra melodic with simple blues riffs. Lyle: The main thing for you to work on is the rhythm guitar part for this jam. Being able to play a good rhythm groove is most important. Then learn to noodle around with the scales and riffs for extra fun.